THE TOGETHER FOR Yes campaign, which is calling for a Yes vote in the upcoming Eighth Amendment referendum, has said that its fundraising site shut down for half an hour yesterday due to a DDOS attack. The interruption took place at 5.45pm, which Together for Yes said would “ordinarily be a peak time for donations”. Amnesty International Ireland, which is also calling for a ‘Yes’ vote in the upcoming referendum, said that its page was similarly affected at the same time. 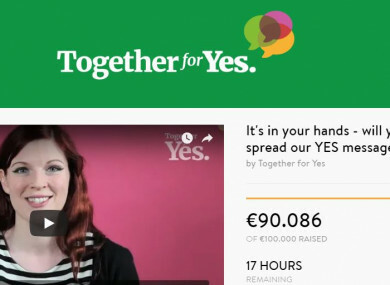 US company CauseVox, which hosts the Together for Yes campaign’s donations page, said that a DDOS (distributed denial-of-service) attack had caused the interruption. This is where a website is purposefully bombarded with requests to a point where it shuts down. CauseVox said that the attack came from within Ireland. Sarah Monaghan, Together For Yes spokesperson, said: “We are continuing to investigate this extremely serious incident and are actively consulting security experts in the field to help identify the specific source of the attack, and have made a report to Gardaí. Together For Yes is a national grassroots movement which relies on small donations from large numbers of people. Our crowdfund initiative is a core element of the manner in which we resource our campaign and therefore we would take extremely seriously any attempt to undermine it. Amnesty International Ireland confirmed that its crowd funding website was also attacked yesterday evening, which it called “ a serious issue”. It said that Causevox was able to get the page it up and running again “quickly”. Separately, Google announced yesterday that from today, it was suspending all adverts relating to the Eighth Amendment referendum for the next two weeks. That ban extends across all platforms, including YouTube and AdWords. ‘Vote No’ campaigners accused the tech giant of rigging the referendum in favour of the Yes side, saying that they relied on online advertising. Email “Together for Yes says its donations page was shut down by a cyber attack”. Feedback on “Together for Yes says its donations page was shut down by a cyber attack”.